VietNamNet Bridge – The box office revenues in Vietnam increased from $7 million in 2008 to $43 million in 2012. With the increase of 514 percent in four years, from 2008 to 2012, the Hollywood Reporter ranked Vietnam as one of the 13 “hottest” growing cinema markets in the world. 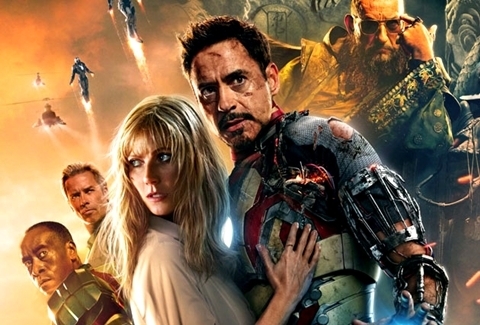 "Iron Man 3" collected nearly VND20 billion ($1 million) in the first four day in Vietnam. In Vietnam, where the law and business practices have not yet forced movie distributors to make public their box office revenues in a transparent manner, the data released by the Hollywood Reporter (USA) on May 9 is rare and considered reliable. According to the report, Hollywood Reporter ranked Vietnam in the list of the 13 emerging markets with the hottest growth rates in Southeast Asia, the Middle East and South America. Specifically, for a period of four years, the growth rate of total box office revenues in Vietnam is up to 514 percent, from $7 million in 2008 to $43 million in 2012. With a population of 92 million people, ranking 14th in the world, there is an ongoing race to build theaters between domestic and foreign firms in Vietnam. The appearance of new movie distributors has helped enrich the source of imported films. Recently, Megastar announced to earn nearly VND20 billion ($1 million) from "Iron Man 3" – the opening film for the summer movie season - in Vietnam in the first four days. This is really a huge gap compared with VND7.6 billion ($364,000) which was considered a record that "Kung Fu Panda" made in the entire 2008 summer. Photo: "Kung Fu Panda" took the whole 2008 summer to earn $364,000 in Vietnam. Vietnam has the highest growth rate among the 13 emerging markets, followed by Indonesia - with a population of 251 million and a 171 percent increase. The following names are Taiwan, Malaysia, Ecuador, the Philippines, Columbia, Oman ... At the same time, the revenue in Europe and North America is on a decline or leveling off. These are the major markets of Hollywood, besides the world's second largest market - China. Although Hollywood has to face some legal issues such as piracy and censorship in the emerging markets, overall, these are very potential markets.